The ISBA will hold their Annual Convention in Coeur d’Alene on November 6-8. Resolutions to be brought forth for vote include the “Statewide Software Application for Data Collection” which provides for the “574 data points now being collected by the State resulting in thousands of lines of data when data points are used” and “the data points have continued to change as reporting requirements have increased” and are used for reporting purposes to Federal entities and the Statewide Longitudinal Data System. With the rule changes to the Family Education Protection Act removing parental rights and protections to their child’s and their family’s personal information, this Resolution should not be passed. 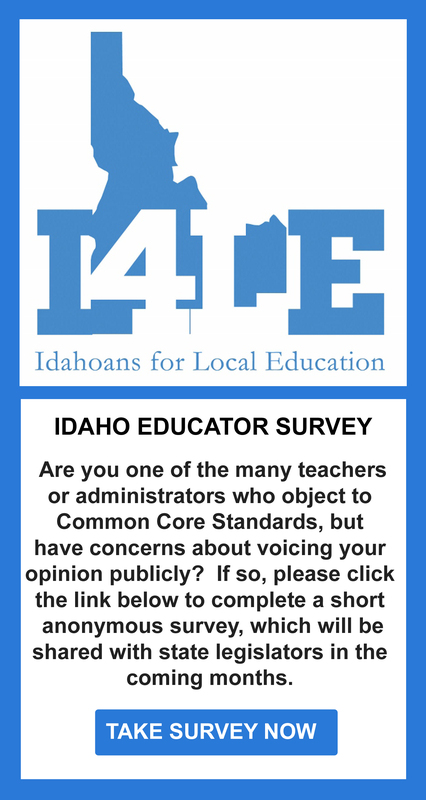 The second Resolution is “Support for Idaho Core Standards” that claims “are research based and competitive with standards implemented in other countries” which is both misleading and inaccurate. It can be argued that the Idaho Core Standards are lower than the standards they replace and are not an improvement for our children’s education quality. There is no doubt Idaho deserves better standards but Idaho Core Standards are a step in the wrong direction. This resolution would “communicate to the Idaho State Legislature the importance of staying the course with respect of implementation to the ICS.” Parents and school boards need to understand that the ICS are so named due to the copy write license with the copy write holder and that they are neither state led nor state owned. Remaining in the Core Standards will remove all local parent and school board control of our children’s education. If parents and school boards want to continue to have a voice in the education process for our children we need to start communicating with our school boards now.